When to Plant Fruit Trees in Las Vegas? How Often Do You Water Fruit Trees? Most homeowners don't have the same kind of space for growing fruit trees that, say, a commercial grower has. Homeowners also wish to keep their fruit trees smaller than commercial trees. For these reasons fruit trees are often planted closer together on residential lots than they are in a commercial orchard. Still, minimum distances should be maintained between fruit trees to prevent an overcrowded look and to maintain the health of the trees. Choose the type of trees you want to plant. Consider whether you'll be planting standard, semi-dwarf or dwarf varieties. Different varieties require different spacing (semi-dwarf and dwarf trees require the least). Mark the area in which you plan to plant your trees. Ensure sufficient space between your planting marks before digging your holes. When planting standard apple trees allow 25 feet between trees. 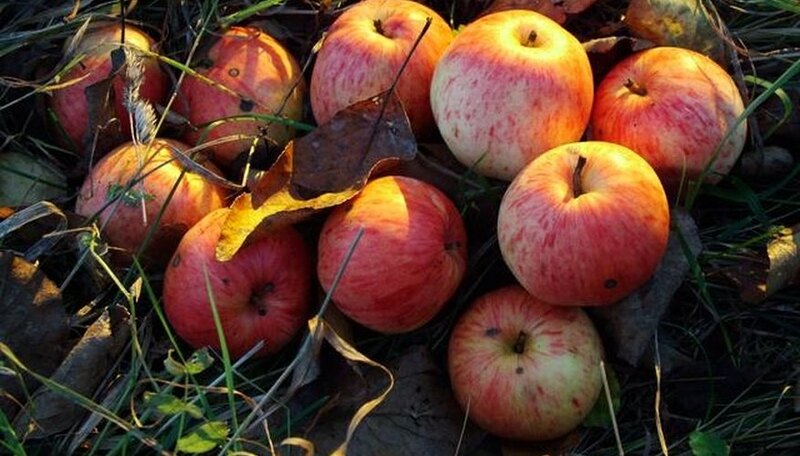 Semi-dwarf apples need 18 feet of space between them and dwarf apples require 12 feet. Apricots need 18 feet of space; so do plums. 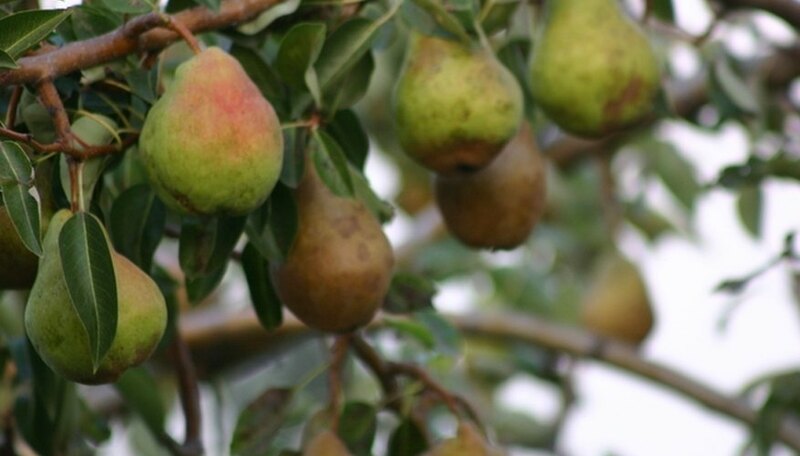 Standard pear trees need 25 feet while a dwarf pear needs about half as much space. Measure the distance to fences and walls as well as between the trees themselves. Allow the same space between trees and walls as you do between the trees. Once you have determined how many of which variety you can fit within the space you have, dig your holes. The Indian gooseberry tree can grow in moderate climates where the tree gets plenty of shade and moisture. It produces large, juicy, green- to orange-colored gooseberries that can be used in jams, pies and glazes. The persimmon tree thrives best in USDA hardiness zones 7 and 10, and requires mild temperatures all year. The fruits are dark orange to red in color and delicate in flavor. Olive trees have thin branches that bear the small fruits. There are several varieties of olive tree. Some, such as the Russian olive tree, can grow in cold climates. The lychee tree is slow-growing and massive, with thick, hard wood. It produces small red fruits that resemble strawberries, but the pretty fruit exterior is really a thick, waxy skin that contains the actual lychee fruit. Cherry trees are found throughout the world. There are 40 or more varieties, ranging from bing cherry to black cherry. Along with the fruit, cherry trees produce light and delicate pinkish-white blossoms that are highly fragrant. 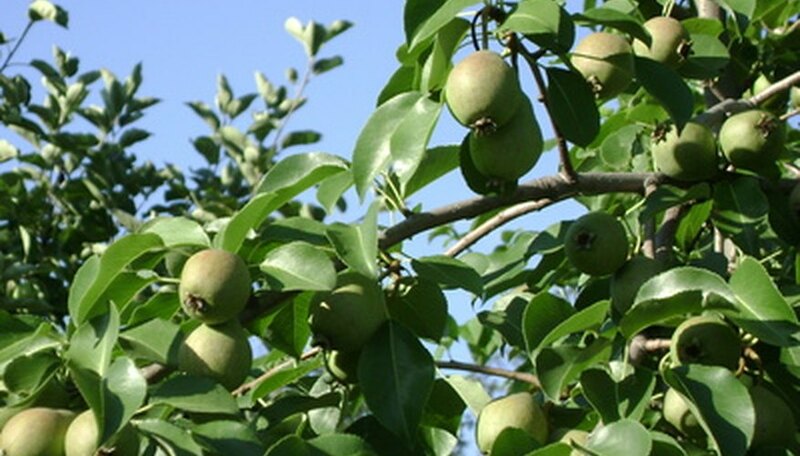 Pear trees grow well in temperate, cool climates, and they grow as tall as 17 meters in height. The large, luscious green foliage turns to shades of red and orange in the autumn months. 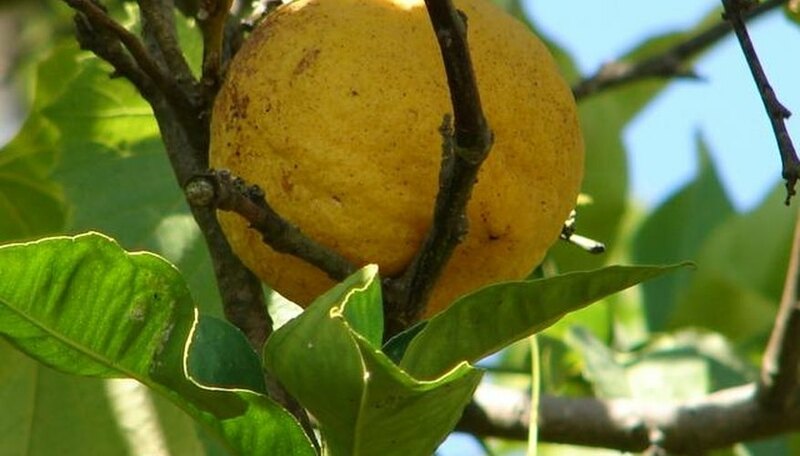 Fruit trees need a different mixture of fertilizer than other trees. Typical fertilizer contains too much nitrogen that can create a bumper crop in lush vegetation in fruit trees without much fruit production. Using a low-nitrogen mixture with water-soluble nitrogen, phosphorus and potash in a 1-2-1 ratio works best. Water-soluble nitrogen will time-release through the season for continued feeding. 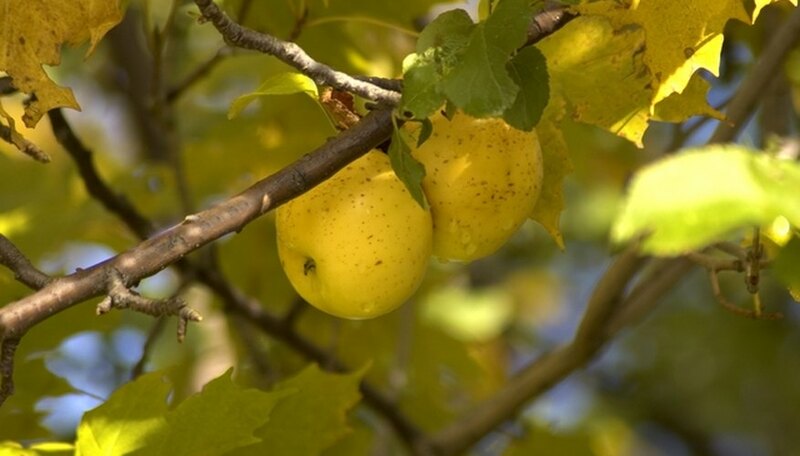 Generally, fruit trees may only need to be fertilized if the tree is showing signs of stress, such as yellowing leaves or stunted growth. Water the soil thoroughly when freezing temperatures are expected. Soil that has been thoroughly watered will absorb radiation from the sun more readily than dry earth will. This radiation will provide heat to fruit trees, even at night. Apply mulch to the ground surrounding fruit trees. A thick blanket of mulch provides heat and protection from frost. If your fruit trees already have mulch, remove it to prevent damage from established pests, mold or mildew. Apply 4 to 6 inches of fresh mulch. Cover the branches and limbs with old sheets, quilts or black plastic sheeting. However, foliage that comes into contact with the cover may be damaged by the transfer of heat. Another option is to pitch several lengths of PVC pipe around the fruit trees and create a tent with a cover. The cover material should reach the ground for maximum protection. Remove the cover on sunny days. Cover the trunk. If you live in a region that experiences frequent freezing temperatures, cover the trunk in commercially available foam, fiberglass or paper tree wrap. Remove tree wraps in the spring. Wrap the tree in holiday lights. The small lights provide a safe source of heat that will protect many fruit trees, especially citrus, from frost and freezing temperatures. Wind strands of small lights around the canopy and turn them on before the temperature drops. Remove all grass and weeds in a circle at least 4 feet in diameter around the tree. If planting a new tree, do this prior to planting. Prune the tops of fruit trees with a bypass pruner after they have been planted to encourage a strong leader to provide side branches. Cut and remove any side branches from newly planted trees down to ¼ inch. Cut at an angle. Prune heavily only when the tree is in a dormant state. Remove dead or diseased shoots and branches. Thin fruit at least 6 inches apart to ensure the remaining fruit is of good quality and size. Test the soil. A soil high in phosphorus and potassium should receive a nitrogen fertilizer. A soil low in phosphorus and potassium should receive a balanced fertilizer, such as 10-10-10. Fertilize your fruit trees at least 10 inches away from the trunk on the soil surface. Fertilize one month prior to new growth in the spring. Spray pesticides as a preventive measure, and when moths, aphids and mites are present. Never spray fruit trees while they are in bloom, unless they are infected with fire blight, a fatal bacteria that gives flowers and stems a burnt appearance. Read pesticide labels carefully and use according to label directions for your fruit tree. Paint the trunk of the tree with white latex paint to reduce winter injury. Paint the lower 24 inches of the trunk. Fruit trees generally do not need fertilization unless their growth is stunted with a growth rate of less than 8 inches per year, according to Iowa State University. 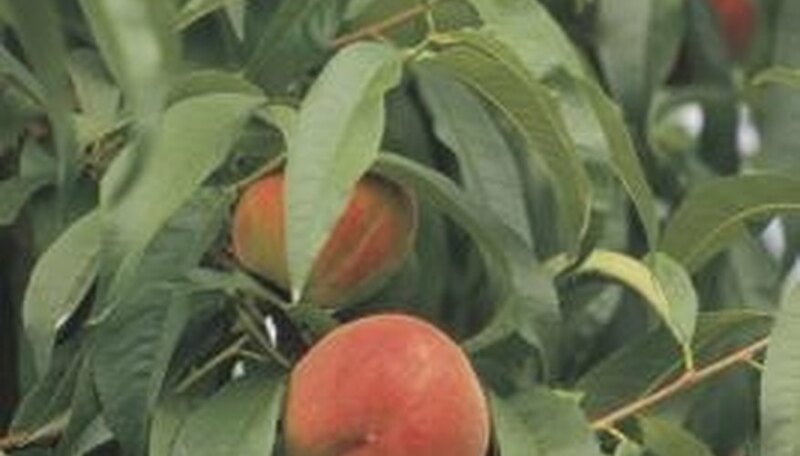 If your fruit trees need fertilizing, Texas A&M recommends a 21-0-0 fertilizer for soils with a pH of above 7, or a 15-5-10 fertilizer if the pH is below 7. Apply in the spring. Wait for a day when the temperatures outside are between 40 and 90 degrees Fahrenheit. You also need a day, preferably morning, that has little to no wind or rain. Once these conditions are met, you can make and apply your homemade oil spray. Pour the horticultural oil in a backpack sprayer. This will make enough oil spray to cover one fruit tree. Add water to the backpack sprayer. If you need to spray more than one fruit tree, you can double the horticultural oil and water measurements. Shake the backpack sprayer to combine the two ingredients and then spray your fruit tree with it. Make sure you are getting under all of the leaves on the fruit trees, as this is where many of the insects like to hide. Repeat once per month until you no longer have insects on your fruit trees. 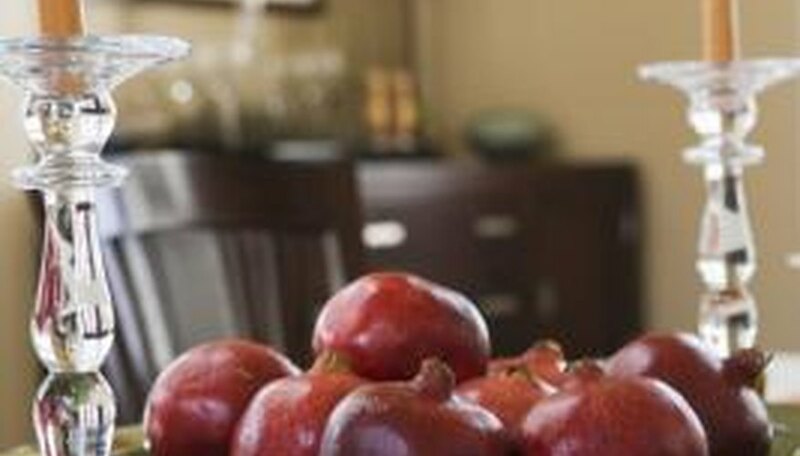 The best time to plant fruit trees like apricots and pomegranates in Las Vegas is during the winter. They are dormant during this time and not producing fruit. Planting in the winter also allows the roots time to establish themselves. Trees like apricots also need a winter chill to produce fruit. There is never a good time to plant citrus fruit trees in Las Vegas. While it may seem like citrus trees like lemons and oranges would thrive in southern Nevada's hot weather, the cold winters in the region will likely kill them. The best time to plant container fruit trees in Northern California is fall, winter and spring. Winter is best for bare-root fruit trees. They can still be planted in summer if watered thoroughly, though the heat will make it more difficult for the tree to become established. Run power cords to the area where the trees are located. If the trees are a long way from a power source, you might need to use a generator. Plug in a variety of freeze helpers such as large fans, space heaters or heat lamps. While you won't use them all at the same time, the heaters and heat lamps would work well together. Heaters stay on the ground near the base of trees and allow hot air to rise through the branches, while the heat lamps hang in the branches, giving them a closer heat source. Fans keep air moving so frost cannot settle on fruit or buds. Spray fruit trees with mist during extremely cold temperatures. The mist freezes over the branches, fruit and buds. This thin layer of ice acts as a shield to outside weather conditions and protects the tree from burn. Wrap small trees that are not fully grown in burlap. The cloth shields the young trees against wind and keeps off frost. Seaweed spray poses a double benefit to fruit trees. First, seaweed spray contains zinc, iron, barium, sulfur, calcium and magnesium–minerals essential to a plant's energy production. Second, seaweed spray naturally repels slugs, making it an excellent spray around the base of a fruit tree. Soap is a strong natural insect killer that is entirely harmless to people. Soap acts by melting the insect's waxy coating–causing them to dehydrate. For an added potency, soap can be mixed with some canola oil. The canola oil absorbs into the insect's exoskeleton and smothers them. Soap spray should be applied from both above and below a tree so that both sides of the leaves are covered. Mites do a great deal of damage very quickly to a tree's foliage and bark. Exterminate and repel future grubs through the use of hot pepper sauce. For a strong treatment, mix together some hot pepper sauce and soap in a gallon of water. Let the mixture sit overnight and spray it onto the plants the next morning. The mixture is harmless to all parts of the plant, but will kill the mites by melting their waxy coating and burning them to death. Even more effective, the hot pepper sauce remains on the tree to prevent future mite damage. Put on a long-sleeved shirt, and a pair of long pants before using the insecticide with malathion. The Gowan Company also recommends wearing socks and shoes. This will prevent the chemical from accidentally splashing on your skin. Put on a pair of chemical-resistant gloves, a mask and a pair of goggles. Pour 1 1/4 pt. of insecticide containing malathion in a garden sprayer. Add 12 gallons of water to the garden sprayer and mix the two ingredients together. Spray the insecticide directly onto the foliage, as well as the fruit on your fruit tree. If your fruit tree is tall, you may need a ladder to reach the top of the tree. It is easier if you start at the top of the tree, and work your way down. Control flatheaded appletree borers by keeping your trees in good condition through fertilization and wrapping, suggests the University of Missouri Extension. This type of borer usually extricates his adult self from your tree in May and lays eggs on the bark all summer. By fertilizing areas of the trunk that are exposed, and wrapping the lower levels of trunk in burlap, the pests will not be able to lay eggs directly on the bark. Cut the outer layer of bark on your fruit trees open if you notice larvae or adult borer worms, and kill the pests with your knife. This method works only if you only cut superficial layers of bark and see very few larvae on the bark; cutting too deeply will damage the tree. Spray the lower limbs of your fruit trees liberally with chemical insecticides to kill off the bore worms and eggs -- enough so that the product puddles on the ground. Permethrin-based sprays can be effective in controlling appletree borers. Chlorpyrifos-based products are effective on peachtree borers and a simple wash of latex paint may control shot hole borers, according to the University of Missouri Extension. Bare-root fruit trees are generally purchased and planted during the winter, when they are dormant. Mid-December to mid-February is the optimum time. Map out your landscape design. Use graph paper to create a map of where you want to plant the trees, including the distance between the trees to support the growth. Take into account the amount of sunlight, soil type and the type of fruit trees you intend to use in your design. 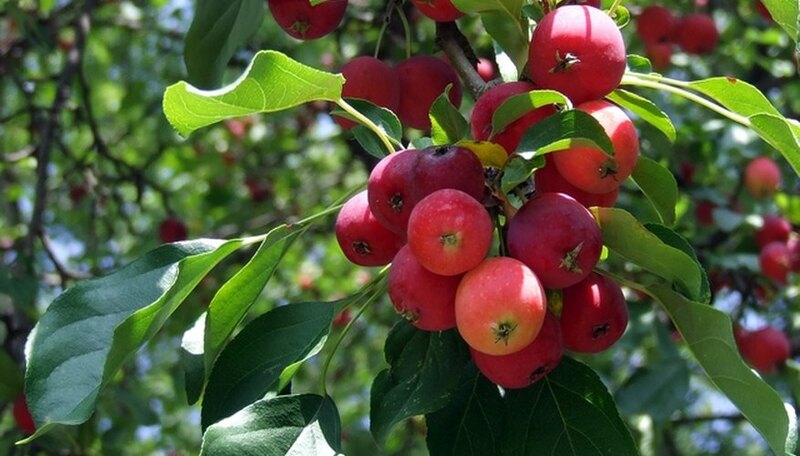 Purchase a minimum of two of each of the types of fruit trees that you want to plant. Choose disease-resistant varieties. Space out your trees and place them on the ground prior to planting. Double check with you garden design and make changes as you see fit. Plant your fruit trees. Dig a hole two times the depth and widths of the root ball. Set the tree in hole and fill it with the soil you removed. Cover the base of the tree with mulch. Water fruit trees once a week during their first season. Young saplings transplanted from containers require more frequent watering until the root ball adjusts to the new location. Clean the fruit tree roots. Place them under running water to remove any soil. Spread on a table to dry; takes approximately one hour. Label trees with the species and variety. Use labels with strings attached and write in permanent marker. Line a 2-gallon bucket with burlap. Place the fruit tree seedling in the bucket. Fill the bucket with sterile soil. The soil should cover the roots and 8 inches of the trunk. Wrap the burlap around the soil and roots. Secure with wire ties. Place the trees into the shipping box. Fill empty spaces with pack peanuts to secure the trees in place. Tape box closed. Properly address a priority mail label and affix to the box. Buy a bottle of organic fertilizer. Most nurseries keep organic fertilizers in stock and can help you choose one that will work best for your fruit trees and climate. Make organic fertilizer for your fruit trees. Decaying food peels and other "green" waste can be layered with shredded newspapers or dried leaves to make an organic compost for soil fertilizer. Use equal amounts of beer, ammonia and Epsom salts in a hose sprayer to distribute organic fertilizer to your fruit trees. Not only is this a great way to grow fruit trees, but it also works on your lawn. Let a 2 lb. fish rot in a watering can for a month or more. Fill with water and pour the nutrient-rich liquid on the base of your fruit tree. Cover the fish with organic compost to disguise the odor, or bury the rotten fish at the base of the tree for a similar (less-odorous) effect.